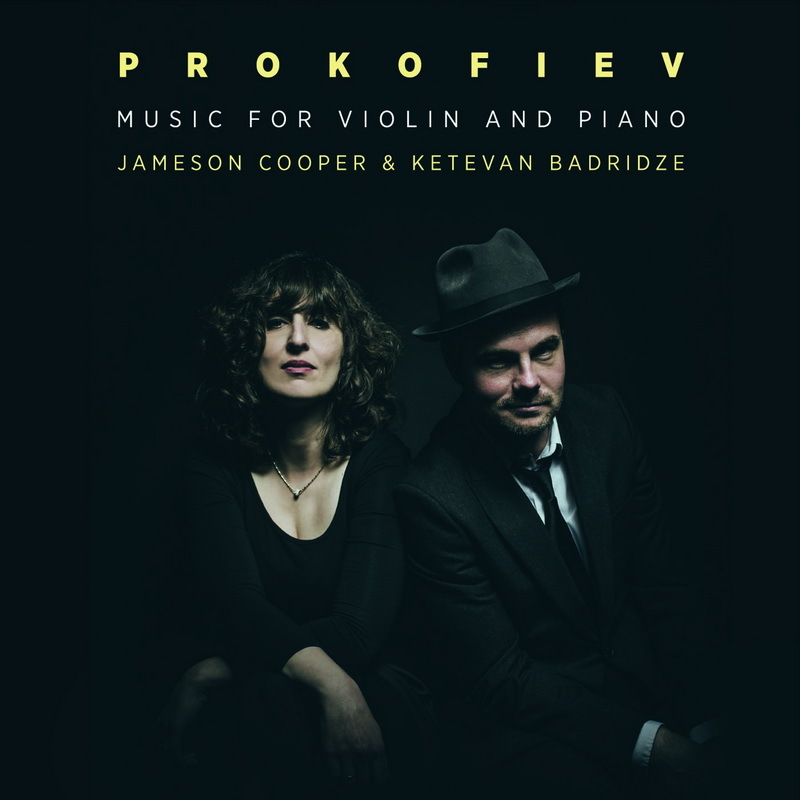 There’s more lovely duo playing on Prokofiev Music for Violin and Piano, the debut duo CD by violinist Jameson Cooper and pianist Ketevan Badridze issued on the Afinat Records label (AR1601) in celebration of the 125th anniversary of the composer’s birth. The English-born Cooper has long been active in the United States, and is the first violinist with the Euclid Quartet in residence at Indiana University South Bend, where Badridze is also on the faculty as a senior lecturer. It’s a CD that certainly makes a lovely birthday present, with outstanding playing of the three works on the program: the Five Melodies Op.35bis; the Violin Sonata No.1 in F Minor Op.80; and the Violin Sonata No.2 in D Major Op.94bis. Both performers are in great form, with their outstanding techniques allowing them to explore the emotional depths of the dark and intensely personal F Minor sonata in particular. Cooper and Badridze have some top competition in this field – I’ve reviewed similar CDs by Viktoria Mullova, Alina Ibragimova, Jonathan Crow and James Ehnes in the last few years – but this is a disc that can more than hold its own. Cooper’s insightful and perceptive booklet notes complete a terrific package. These [Five Melodies] partake fully of Prokofiev’s style, and invite a level of expressive warmth that they receive in full from the performers here." The ‘American’ Quartet’s easy flow of indelible melodies disguises a wealth of awkward displacements – notes that in a more string-oriented key might ring out sympathetically often fall on a string or in a position that clouds potential brilliance. The Euclid Quartet gets around the problem convincingly by adopting an unusually clean style of articulation, exchanging indulgent cantabile warmth for crisply enunciated phrases that appear to be dancing continuously. The players’ spick-and-span approach lends an almost neo-Classical air to Dvořák’s cross-cultural invention, so that one is less aware than usual of a composer finding ingenious solutions to structuring tuneful material. If Dvořák’s pentatonic thinking intentionally blurs the distinction between authentic Czech and American folk melodies, in his first quartet (composed in 1995) Wynton Marsalis captures unmistakably the authentic vibe of Creole music in seven colourful movements that pay homage to the famous traditional balls given in New Orleans during the 18th and 19th centuries. Via music of insatiable creative energy, Marsalis conveys the spirit of country-dance folk fiddle, the blues, rag and (in the fifth movement) the thrill of a steam locomotive in full flow. Captured in vivid sound of exceptional detail, the members of the Euclid Quartet hurl themselves into the fray with alacrity, relishing the music’s invention with contagious wit and virtuosity. What an interesting pairing of works the Euclid Quartet have come up with for their new disc. ‘American Quartets’ teams Dvořák’s String Quartet No 12 in F, known as the American, with Wynton Marsalis’s String Quartet No 1, At the Octoroon Balls. There is little hard evidence of anything specifically American within Dvořák’s quartet but its spirit appears to have been influenced by the composer’s residency in the United States (1892‑95). The music overflows with folk-like material – perhaps more Czech than Yankee – and the prevailing atmospheres are suffused with the warmth, pride and vitality this composer wore so generously on his sleeve. The Euclid Quartet play the piece with bounties of fervour and poetry, while always heightening the score’s meticulous craftsmanship. Marsalis continues to be a musician of wondrous resourcefulness. Along with his superior abilities as a jazz trumpeter, he has broadened his artistic purview in a series of ambitious compositions. His First String Quartet evokes American Creole traditions in his native New Orleans through seven movements of varied and inventive incident. The opening movement, ‘Come Along Fiddler’, is an expansive tour de force for solo violin. The subsequent buoyant and lyrical movements explore a range of cultural references, with blues, ragtime and jazz giving the string quartet a kaleidoscopic workout. The Euclid musicians make a veritable feast of the score. Jameson Cooper exults in the first movement’s beguiling flights, and he and his colleagues are at turns tender, whimsical and stirring in Marsalis’s other smashing bursts of imagination. "From the very first track of this CD we are quite aurally assured of being in the good company of kindred spirits... [Dvořák's F Major Quartet] is given in this CD an exuberantly played performance that on repeated playbacks continues to delight the listener. The Euclid Quartet has a limpid sound, a faultless technique and both musicianship and musicality... With an equal mix of precision and panache, the Euclid takes on the jazz-inflected, freely polytonal musical language of Wynton Marsalis’ At the Octoroon Balls. Marsalis brilliantly spices up his multi-ethnic musical gumbo, creating a vibrantly rhythmic composition that provides the Euclid Quartet with an opportunity to successfully show their virtuosic versatility..."
"Antonín Dvorák’s “American” string quartet is among the composer’s most famous chamber works, and it’s been recorded many times over the decades. Usually, LP and CD versions of the work find it paired with quartets by other European composers such as Mozart or Brahms. But for its latest CD, the Euclid Quartet gives Dvorák’s American-themed piece a fittingly American partner: Wynton Marsalis’ String Quartet No. 1: “At the Octoroon Balls.” The album, called “American Quartets,” is a brand-new release, out this week on Afinat Records..."